Cornu aspersum, known by the common name garden snail, is a species of land snail. As such it is a terrestrial pulmonate gastropod mollusc in the family Helicidae, which includes some of the most commonly familiar land snails. Of all terrestrial molluscs, this species may well be the most widely known. In English texts it was classified under the name Helix aspersa for over two centuries, but the prevailing classification now places it in the genus Cornu. Cornu aspersum is native to the Mediterranean area and Western Europe, but whether deliberately or accidentally, humans have spread it to temperate and subtropical areas worldwide. The snail is relished as a food item in some areas, but it is also widely regarded as a pest in gardens and in agriculture, especially in regions where it has been introduced accidentally, and where snails are not usually considered to be a menu item. Cornu aspersum in warm regions commonly emerges in moist weather in winter. The adult bears a hard, thin calcareous shell 25–40 mm in diameter and 25–35 mm high, with four or five whorls. The shell is variable in coloring and shade of color, but generally it has a reticulated pattern of dark brown, brownish-golden, or chestnut with yellow stripes, flecks, or streaks (characteristically interrupted brown colour bands). The aperture is large and characteristically oblique, its margin in adults is whitish and reflected. The body is soft and slimy, brownish-grey, and able to be retracted entirely into the shell, which the animal does when inactive or threatened. When injured or badly irritated the snail produces a defensive froth of mucus that might repel some enemies or overwhelm aggressive small ants and the like. It has no operculum; during dry or cold weather it seals the aperture of the shell with a thin membrane of dried mucus; the term for such a membrane is epiphragm. The epiphragm helps the snail retain moisture and protects it from small predators such as some ants. The snail's quiescent periods during heat and drought are known as aestivation; its quiescence during winter is known as overwintering. When overwintering, Cornu aspersum avoids the formation of ice in its tissues by altering the osmotic components of its blood (or haemolymph); this permits it to survive temperatures as low as -5 °C (23 °F). During aestivation, the mantle collar has the ability to change its permeability to water. The snail also has an osmoregulatory mechanism that prevents excessive absorption of water during hibernation. These mechanisms allow Cornu aspersum to avoid either fatal desiccation or hydration during months of either kind of quiescence. During times of activity the snail's head and "foot" or "belly" emerge. The head bears four tentacles; the upper two are larger and bear eye-like light sensors, and the lower two are tactile and olfactory sense organs. The snail extends the tentacles by internal pressure of body fluids, and retracts all four tentacles into the head by invagination when threatened or otherwise retreating into its shell. The mouth is located beneath the tentacles, and contains a chitinous radula with which the snail scrapes and manipulates food particles. The shell of Cornu aspersum is almost always right-coiled, but exceptional left-coiled specimens are also known; see Jeremy (snail) for an example. The accepted name of the species was long considered to be Helix aspersa, a member of the genus Helix. However, in a number of publications since 1990, it has instead been placed in various genera previously considered as subgenera of Helix. One such genus is Cornu, which is appropriate if the species is considered as congeneric with the species previously known as Helix aperta. Then the name would be Cornu aspersum. Previously there was debate whether Cornu was a valid generic name (because it was first applied to teratological specimens), but a 2015 ruling has confirmed that it is so. Until this was established, Italian research teams and others used the generic name Cantareus instead. Other workers, including Ukrainian and Russian research teams, who regard H. aspersa and H. aperta as being in different genera, call the former Cryptomphalus aspersus. It also still remains an arguable position to retain Helix as the generic name. Like other Pulmonata, the individuals of the species Cornu aspersum are hermaphrodites, producing both male and female gametes. Reproduction is usually sexual, although self-fertilisation sometimes occurs. During a mating session of several hours, two snails exchange sperm. 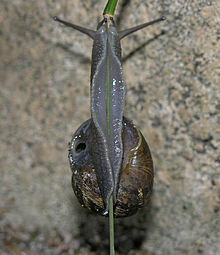 Cornu aspersum is one of the species that uses love darts during mating. 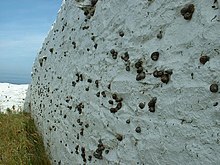 About two weeks after fertilisation, the snail lays a batch of about 80 spherical pearly-white eggs into crevices in the topsoil, or sheltered under stones or the like. In a year it may lay approximately six batches of eggs. The size of the egg is 4 mm. The young snails take one to two years to reach maturity. In some regions snail farms produce these snails commercially. Cornu aspersum is native to the Mediterranean region (including Egypt) and Western Europe, from northwest Africa and Iberia, eastwards to Asia Minor, and northwards to the British Isles. About the beginning of the 20th century, a number of North African endemic forms and subspecies were described on the basis of shell characteristics. The commonest subspecies, Cornu aspersum aspersum (synonym Helix aspersa aspersa), has become very abundant, mainly in agricultural and residential human habitats where the climates is temperate, Mediterranean, or subtropical. Cornu aspersum is a typically anthropochorous species; it has been spread to many geographical regions by humans, either deliberately or accidentally. Nowadays it is cosmopolitan in temperate zones, and has become naturalised in many regions with climates that differ from the Mediterranean climate in which it evolved. It is present on all continents except Antarctica, and occurs on most major islands as well. Its passive anthropochory is the likeliest explanation for genetic resemblances between allopatric populations. Its anthropochorous spread may have started as early as during the Neolithic revolution some 8500 BP. Such anthropochory continues, sometimes resulting in locally catastrophic destruction of habitat or crops. Its increasing non-native distribution includes other parts of Europe, such as Bohemia in the Czech Republic since 2008. It is present in Australia, New Zealand, North America and southern South America. It was introduced to Southern Africa as a food animal by Huguenots in the 18th century, and into California as a food animal in the 1850s; it is now a notorious agricultural pest in both regions, especially in citrus groves and vineyards. Many jurisdictions have quarantines for preventing the importation of the snail in plant matter. C. aspersum shell cemetery. Individuals failing to overwinter in Scotland. Cornu aspersum is a primarily a herbivore with a wide range of host plants. It feeds on numerous types of fruit trees, vegetable crops, rose bushes, garden flowers, and cereals. It also is an omnivorous scavenger that feeds on rotting plant material and on occasion will scavenge animal matter, such as crushed snails and worms. In turn it is a food source for many other animals, including small mammals, many bird species, lizards, frogs, centipedes, predatory insects such as glowworms in the family Lampyridae, and predatory terrestrial snails. The species may on occasion be of use as an indicator of environmental pollution, because it deposits heavy metals, such as lead in its shell. Parasites of Cornu aspersum include the nematode Nemhelix bakeri (family Cosmocercidae). Cornu aspersum leaving mucus-conserving trail over dry brick. The belly visibly leaves the ground in two places in a wave motion without dragging. That wave motion is independent of the wave of muscular contraction that drives the locomotion. 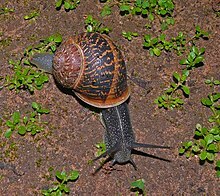 The snail secretes thixotropic adhesive mucus that permits locomotion by rhythmic waves of contraction passing forward within its muscular "foot". Starting from the rear, the contraction of the longitudinal muscle fibres above a small area of the film of mucus causes shear that liquefies the mucus, permitting the tip of the tail to move forward. The contracted muscle relaxes while its immediately anteriad transverse band of longitudinal fibres contract in their turn, repeating the process, which continues forward until it reaches the head. At that point the whole animal has moved forward by the length of the contraction of one of the bands of contraction. However, depending on the length of the animal, several bands of contraction can be in progress simultaneously, so that the resultant speed amounts to the speed imparted by a single wave, multiplied by the number of individual waves passing along simultaneously. A separate type of wave motion that may be visible from the side enables the snail to conserve mucus when moving over a dry surface. It lifts its belly skin clear of the ground in arches, contacting only one to two thirds of the area it passes over. With suitable lighting the lifting may be seen from the side as illustrated, and the percentage of saving of mucus may be estimated from the area of wet mucus trail dabs that it leaves behind. This type of wave passes backwards at the speed of the snail's forward motion, therefore having a zero velocity with respect to the ground. The snail moves at a top speed of 1.3 centimetres per second (47 meters per hour or ~50 yards per hour), and has a strong homing instinct, readily returning to a regular hibernation site. In spite of its apparent slowness and limitations, the snail exploits the special nature of its mucus to achieve some startling feats. It can go up a slope at any angle, including upside down, resist being pulled off a firm surface with an adhesive strength several times its own weight, rest on a surface at any angle without any expenditure of energy, or, notoriously, climb a needle-like stem or pass over the edge of razor blade without harm, relying on the firmness of its mucus film in its shear-resistant phase. The species is known as an agricultural and garden pest, an edible delicacy, and occasionally a household pet. In French cuisine, it is known as petit gris, and is served for instance in Escargot a la Bordelaise. Also in Lleida, a city of Catalonia, there is a gastronomic festival called L’Aplec del Caragol dedicated to this type of snail, known as bover, and attracts over 200,000 guests every year. From Crete are known a dish called "chochloi mpoumpouristoi"(snails turned upside down), the snails cooked alive in a hot pan, on a thick layer of sea salt. Other dishes with snails are snails with rosemary, etc. The practice of rearing snails for food is known as heliciculture. For purposes of cultivation, the snails are kept in a dark place in a wired cage with dry straw or dry wood. Coppiced wine-grape vines are often used for this purpose. During the rainy period the snails come out of hibernation and release most of their mucus onto the dry wood/straw. The snails are then prepared for cooking. Their texture when cooked is slightly chewy. There are a variety of snail-control measures that gardeners and farmers use in an attempt to reduce damage to valuable plants. Traditional pesticides are still used, as are many less toxic control options such as concentrated garlic or wormwood solutions. Copper metal is also a snail repellent, and thus a copper band around the trunk of a tree will prevent snails from climbing up and reaching the foliage and fruit. Caffeine has proven surprisingly toxic to snails, to the extent that spent coffee grounds (genuine coffee, and not decaffeinated) make a safe and immediately effective snail-repellant and even molluscicidal mulch for pot-plants, or for wherever else the supply is adequate. Garden snails can be easily controlled and trapped with a simple trap created by cutting a plastic bottle in half and burying the bottom half so the top is level with the soil, then partially filling the bottle bottom with any variety of beer. Snails are attracted to the carbohydrates and yeast in beer, and crawl into the trap and drown. This method requires that the trap be checked every day and dead snails removed and the trap refilled with beer as it evaporates over time. Traps should be spaced every three to four meters from one another for coverage of a large garden. 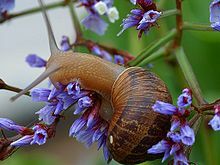 The decollate snail (Rumina decollata) will capture and eat garden snails, and because of this it has sometimes been introduced as a biological pest control agent. However, this is not without problems, as the decollate snail is just as likely to attack and devour other species of gastropods that may represent a valuable part of the native fauna of the region. Cornu aspersum has gained some popularity as the chief ingredient in skin creams and gels (crema/gel de caracol) sold in the US. These creams are promoted as being suitable for use on wrinkles, scars, dry skin, and acne to reduce pigmentation, scarring, and wrinkles. Secretions of Cornu aspersum produced under stress have skin-regenerative properties because of antioxidant Superoxide dismutase and Glutathione S-transferase (GSTs) activities. The secretions can stimulate fibroblast proliferation and rearrange the actin cytoskeleton stimulate extracellular matrix assembly and regulation of metalloproteinase activities for regeneration of wounded tissue. This article incorporates CC-BY-2.0 text from reference. ^ Müller O. F. (1774). Vermivm terrestrium et fluviatilium, seu animalium infusoriorum, helminthicorum, et testaceorum, non marinorum, succincta historia. Volumen alterum. pp. I-XXVI [= 1-36], 1-214, [1-10]. Havniae & Lipsiae. (Heineck & Faber). ^ Ansart, A.; Vernon, P.; Daguzan, J. (2002). "Elements of cold hardiness in a littoral population of the land snail Cornu aspersum (Gastropoda: Pulmonata)". Journal of Comparative Physiology B. 172: 619–625. doi:10.1007/s00360-002-0290-z. ^ Machin, J (1966). "The evaporation of water from Cornu aspersum IV. Loss from the mantle of the inactive snail". Journal of Experimental Biology. 45: 269–278. ^ The species was called Cryptomphalus aspersus on p. 244 in the important and widely distributed work Falkner, G. 1990. Binnenmollusken. - pp. 112-280, in: Fechter, R, & Falkner, G.: Weichtiere. Europäische Meeres- und Binnenmollusken. Steinbachs Naturführer 10. -- pp. 1-288. München. (Mosaik). ^ "The Cornu problem". The Living World of Mollusks. Retrieved 2007-03-05. ^ Welter-Schultes, F. "Genus taxon summary for Cornu. version 12-01-2014". AnimalBase. Retrieved 2011-02-09. ^ Falkner, G.; Bank, R.A.; Proschwitz, T. von (2001). "Check-list of the non-marine molluscan species-group taxa of the states of northern, Atlantic and central Europe". 4 ((1/2)): 1–76. ^ Falkner, G.; Ripken, T.E.J. ; Falkner, M. (2002). "Mollusques continentaux de France. Liste de référence annotée et bibliographie". Collection Patrimoines Naturels. 52: [1–2], 1–350, [1–3]. ^ Bank, R.; Falkner, G.; Proschwitz, T. von (2007). "CLECOM-Project. A revised checklist of the non-marine Mollusca of Britain and Ireland". Heldia. 5 (3): 41–72. ^ ICZN (2015). "Opinion 2354 (Case 3518). Cornu Born, 1778 (Mollusca, Gastropoda, Pulmonata, Helicidae): request for a ruling on the availability of the generic name granted". The Bulletin of Zoological Nomenclature. 72 (2). doi:10.21805/bzn.v72i2.a9. ^ Manganelli, G., Bodon, M., Favilli, L. & Giusti, F. 1995. Fascicolo 16. Gastropoda Pulmonata. - pp. 1-60, in: Minelli A., Ruffo, S. & La Posta, S.: Checklist delle specie della fauna italiana. Bologna. (Calderini). ^ Giusti, F., Manganelli, G. & Schembri, P. J. 1995. The non-marine molluscs of the Maltese Islands. - pp. 1-608. Torino. ^ Neubert, E (1998). "Annotated checklist of the terrestrial and freshwater molluscs of the Arabian Peninsula with descriptions of new species". Fauna of Arabia. 17: 333–461. ^ Manganelli, G.; Salomone, N.; Giusti, F. (2005). "A molecular approach to the phylogenetic relationships of the western palaearctic Helicoidea (Gastropoda: Stylommatophora)". Biological Journal of the Linnean Society. 85: 501–512. doi:10.1111/j.1095-8312.2005.00514.x. ^ Sverlova, N. V. (2006). "O rasprostranenii nekotorɨkh vidov nazemnɨkh mollyuskov na territorii Ukrainɨ". Ruthenica. 16 (1/2): 119–139. ^ Schileyko, A. A. (2006). "Treatise on recent terrestrial pulmonate molluscs, Part 13. Helicidae, Pleurodontidae, Polygyridae, Ammonitellidae, Oreohelicidae, Thysanophoridae". Ruthenica. 2 (10): 1765–1906. ^ Egorov, R. (2008). Treasure of Russian shells. Supplement 5. Illustrated catalogue of the recent terrestrial molluscs of Russia and adjacent regions. Moscow. pp. 1–179. ^ Sysoev, A.; Schileyko, A.A. (2009). Land snails and slugs of Russia and adjacent countries. Sofia: Pensoft. pp. 1–312, figs 1-142. ^ Welter-Schultes, F. "Species summary for Helix aspersa. version 12-01-2014". AnimalBase. Retrieved 2019-03-11. ^ Cowie, R. H. (1984). "The life-cycle and productivity of the land snail Theba pisana (Mollusca: Helicidae)". The Journal of Animal Ecology. 53: 311–325. doi:10.2307/4359. ^ Bezemer, T. M.; Knight, K. J. (2001). "Unpredictable responses of garden snail Helix aspersa populations to climate change". Acta Oecologica. 22: 201–208. doi:10.1016/s1146-609x(01)01116-x. ^ Heller J.: Life History Strategies. in Barker G. M. (ed. ): The biology of terrestrial molluscs. CABI Publishing, Oxon, UK, 2001, ISBN 0-85199-318-4. 1-146, cited page: 428. ^ Commonwealth of Australia. 2002 (April) Citrus Imports from the Arab Republic of Egypt. A Review Under Existing Import Conditions for Citrus from Israel Archived 2009-01-09 at the Wayback Machine. Agriculture, Fisheries and Forestry, Australia. Caption: Gastropods, page 12 and Appendix 2. ^ a b c Annie Guiller, A.; Madec, L. (2010). "Historical biogeography of the land snail Cornu aspersum: a new scenario inferred from haplotype distribution in the Western Mediterranean basin:". BMC Evolutionary Biology. 10: 18. doi:10.1186/1471-2148-10-18. PMC 2826328. ^ Juřičková L. & Kapounek F. (18 November 2009) "Helix (Cornu) aspersa (O.F. Müller, 1774) (Gastropoda: Helicidae) in the Czech Republic". Malacologica Bohemoslovaca 8: 53-55. PDF. ^ "USDA grazing systems and alternative livestock breeds". Archived from the original on 2014-06-23. Retrieved 2014-06-21. ^ Fisher, TW; Orth, RE; Swanson, SC (1980). "Snail against snail". California Agriculture. 34 (11): 18–20. ^ Beeby, A.; Richmond, L. (1989). "The shell as a site of lead deposition in Cornu aspersum". Archives of Environmental Contamination and Toxicology. 18: 623–628. doi:10.1007/bf01055031. ^ (in French) Morand S. & Petter A. J. (1986). "Nemhelix bakeri n.gen., n.sp. (Nematoda: Cosmocercinae) parasite de l'appareil génital de Helix aspersa (Gastropoda: Helicidae) en France". Canadian Journal of Zoology 64(9): 2008-2011. doi:10.1139/z86-303. ^ (in French) Morand S. (1988). "Cycle évolutif du Nemhelix bakeri Morand et Petter (Nematoda, Cosmocercidae), parasite de l'appareil génital de l'Helix aspersa Müller (Gastropoda, Helicidae)". Canadian Journal of Zoology 66(8): 1796-1802. doi:10.1139/z88-260. ^ a b Bonnier Corporation (July 1919). Popular Science. Bonnier Corporation. pp. 42–. ISSN 0161-7370. ^ Chan, Brian; Balmforth, N. J.; Hosoi, A. E. (2005). "Building a better snail: Lubrication and adhesive locomotion". Phys. Fluids. 17: 113101. doi:10.1063/1.2102927. ^ Attia, J (2004). "Behavioural Rhythms of Land Snails in the Field". Biological Rhythm Research. 35: 35–41. doi:10.1080/09291010412331313223. ^ Original film in YouTube, 29 November 2014. ^  Skin Pharmacology and Physiology. Vol. 21 ISSN 1660-5527. Molecular basis for the regenerative properties of a secretion of the mollusk Cryptomphalus aspersa. January 2008. Wikimedia Commons has media related to Cornu aspersum.